FERRARIO - [ Scene of the eclipse of the moon ]. FERRARIO, G. - [ Scene of the eclipse of the moon ]. [ Scene of the eclipse of the moon ]. - FERRARIO, G.
Title : [ Scene of the eclipse of the moon ].. Size : 5.9 x 8.7 inches. / 15.0 x 22.0 cm. Description :Aquatint depicting Peruvian warship by the eclipse of the moon. Mama Quilla (Mama Quilla) was the Inca Pre-Columbian, South American, mother moon goddess who helped to regulate time and the Inca Festival Calendar. The South American Indians were very protective of their mother goddess. 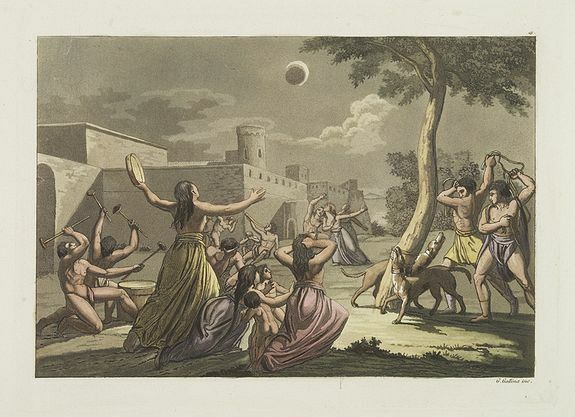 Considering an eclipse of the moon to be perilous time when a mountain lion or snake tried to consume the Divine Feminine energies, they performed noisy rituals in an effort to scare the marauder away. From Giulio Ferrario's work Le Costume Ancien et Moderne ou Histoire du gouvernement, de la milice, de la religion, des arts, sciences et usages de tous les peuples anciens et modernes d'après les monuments de l'antiquité et accompagné de dessins analogues au sujet par le Docteur Jules Ferrario. .